Located on the north face of Potter Mountain near the Massachusetts-New York border, Jiminy Peak is one of the most popular ski areas in Southern New England. Much of the land in which Jiminy Peak is located was purchased by ski photographer and historian Bart Hendricks in the early 1940s. On July 29, 1947, John Clark, John Drummond, and Catamount's John Fisher formed Jiminy Peak, Inc. The trio leased Hendricks' land that year and planned to have a rope tow and T-Bar in operation. The steel needed for the T-Bar did not arrive in time, however, so the opening was postponed. Though the first winter was a non-starter, the $80,000 development was able to open for the 1948-49 season. The 750 vertical foot ski area's T-Bar was the first of its type in all of Southern New England. A pair of rope tows served the lower mountain and Jimmy Cricket slope. From the top of the tows, one could then cross over to a small lodge and the T-Bar. From the T-Bar, one could ski Merry-Go-Round, Whirlaway, 360 Slope, and Slingshot. Another $80,000 investment was made for the 1959-60 season, helping to fix some fundamental issues. The Glasshaus Lodge was constructed at the base of the ski area, adjacent to a new lower T-Bar. In addition, an initial snowmaking system was installed. While the 1959-60 improvements helped Jiminy, chairlifts were popping up throughout Western Massachusetts. In 1964, Fred Crane became principal owner and President of Jiminy Peak. Jiminy Peak was dramatically expanded for the 1964-65 season, as a Mueller double chairlift was installed to the summit. In addition to the expansion of the vertical drop to 1,120 feet, a new base lodge was constructed. 1964-65 was also the season in which rival Brodie Mountain was opened just up the road by Jim Kelly. Snowmaking was expanded to the top of the upper T-Bar at Jiminy Peak for the 1968-69 season, thus providing 750 vertical feet of coverage. In addition, the popular Whirlaway trail was rebuilt and widened, bypassing a section referred to as the "terrible traverse." 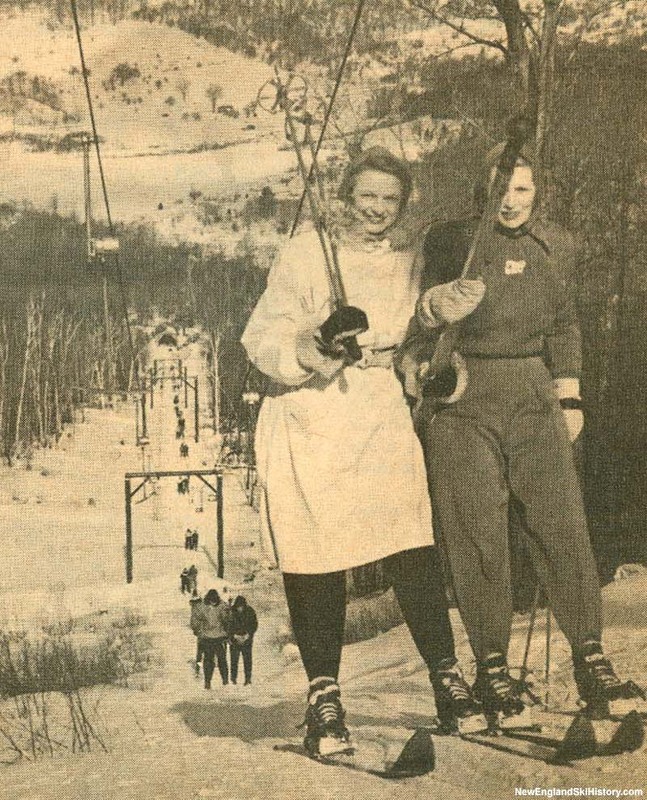 Despite the improvements, Jiminy Peak was still primitive, as stated in Skiing magazine, "Manager Maynard and Fred Crane Jr., president of the corporation, oversee the operation as their fathers once did back in the '50's." The base lodge still had a gravel floor. New York's Kissing Bridge, Inc. took over management of the area in 1969, installing 23 year old Brian Fairbank as Manager on July 7. A $350,000 loan was taken out to install the Grand Slam double chairlift and night skiing. 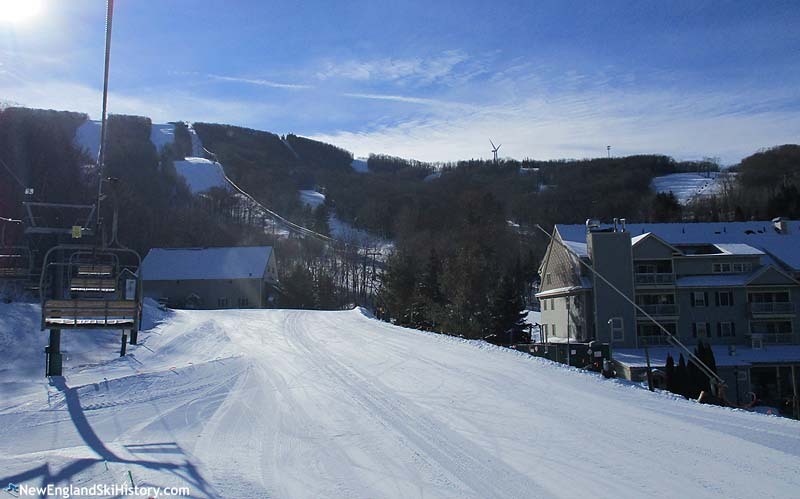 After back to back rough seasons, Jiminy Peak reorganized its ownership. Stock was sold, the land purchased, Brian Fairbank named President. A new focus was put on developing real estate. An expert trail was added for the 1975-76 season, named after Jericho Valley (the original name of the town of Hancock). The Jericho trail is now legendary for its challenging steeps. Later in 1976, plans were made to install a summer attraction. Tragedy struck on the morning of January 30, 1977, when the area's Riblet chairlift rolled backward for 71 seconds, resulting in 12 injuries. A subsequent investigation determined two screws had loosened, resulting in three brakes malfunctioning. Fairbank later reflected, "I thought seriously about quitting the ski business, but it was my whole life. But I knew I had to do something so that I could sleep at night." Repairs were made and procedures changed, placing the lift back in service one week later. In May of 1977, the fifth alpine side in the United States debuted at Jiminy Peak. Not only did the 2,890 foot long slide provide an off season attraction, but it also allowed Jiminy Peak to keep more employees on year round. A $600,000 expansion took place in 1978, as the aging T-Bars were replaced. The new lifts were Riblet double chairlifts, one of which was constructed to the summit. A new lodge was also introduced. Feeling the pain of the poor winters of the early 1980s, Jiminy Peak looked to improve its snow retention and conditioning. $100,000 was invested in grooming equipment for the 1981-82 season, while a new snow retention system was also tested. Invented by Jiminy Peak Director and Williamstown Steinerfilm, Inc. President Gordon Walters, "Sno Coat" was a series of 40 foot wide by 1,000 foot long plastic strips laid on snow much like a baseball field tarp. While the invention was credited with saving snow during an early season rain event, it was quietly abandoned. 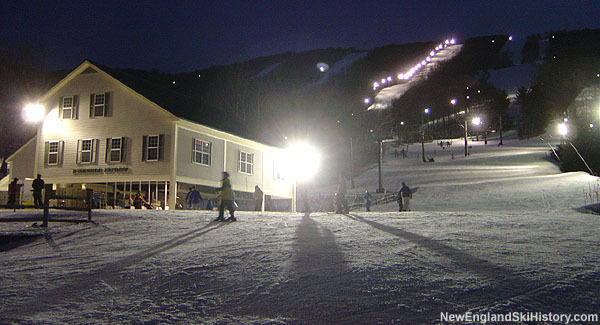 Night skiing was likely expanded to the summit for the 1981-82 season. Two years later, the Mueller summit chairlift was replaced with a new Riblet triple chairlift. 1984 also resulted in the creation of a 10 year master plan, aimed at making Jiminy Peak a year round destination resort. Joseph O'Donnell of Boston Concessions Group was brought into the ownership group around this time. 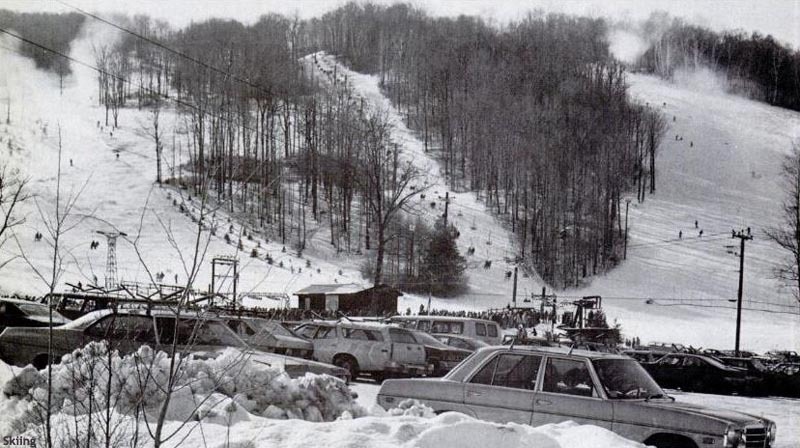 The Jiminy Cricket slope was expanded by 50 percent for 1987-88 when a new Borvig J-Bar replaced the novice rope tow. Meanwhile, the Left Bank trail was lit for night skiing, resulting in Jiminy Peak calling it "the longest lighted trail in the East." The West Way trail was significantly widened for the following season. While the 10 year plan was focused on real estate development and alternative activities, a major enhancement to the ski area was made near the completion of the campaign. The summit quad from recently closed Crotched Mountain was purchased by Jiminy Peak in 1992 and installed as the Q1 Quad. The first four person chairlift in Massachusetts, the new lift dramatically improved the uphill capacity. The recently installed Jiminy Cricket J-Bar was replaced for the 1996-97 season with a realigned, longer triple chairlift, providing better access to the slopes for recent real estate developments. With the ski area continuing to draw large crowds, additional terrain was opened for the 1998-99 season. The upper mountain area, named Widow White's Peak, was served by a new fixed grip quad chairlift. 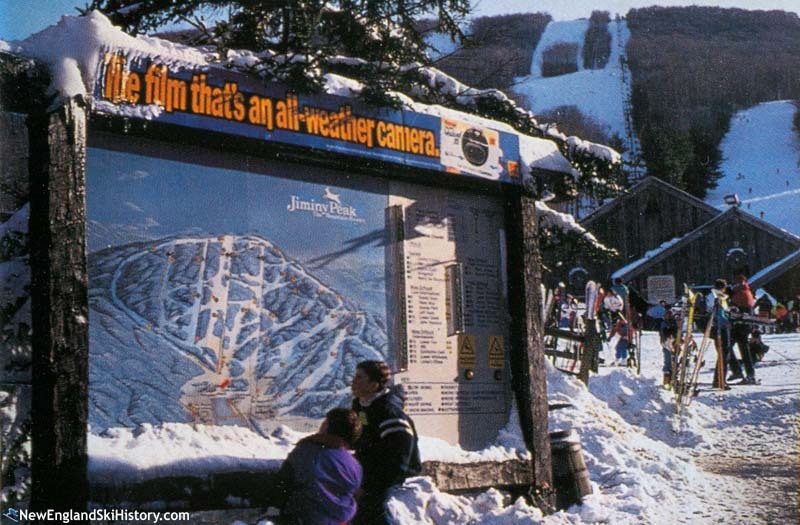 A significant amount of additional terrain was briefly introduced to Jiminy Peak starting in 1999, when the ownership purchased nearby Brodie Mountain. Following the sale, Jiminy Peak co-marketed Brodie and considered modernizing it. Meanwhile, the lower mountain at Jiminy Peak was still served by lower capacity lifts. 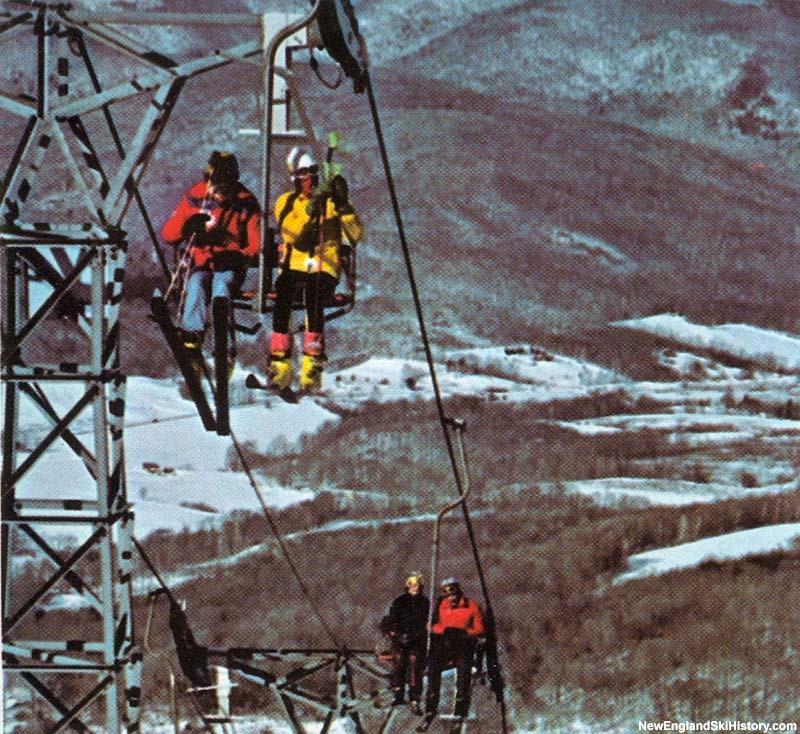 This was addressed for the 2000-2001 season, when the Exhibition double chairlift was replaced with the Berkshire Express, Southern New England's first high speed detachable six person chairlift. The other half of the former double-double chairlift was upgraded to a triple. While $5 million had been earmarked for improvements at Brodie, the area was deemed not viable following the 2001-2002 season. Instead, Brodie was closed and the money was invested in the Village Center at Jiminy Peak. The investment in the base area was unveiled for the 2003-04 season when the Burbank Children's Center and Paul Major Welcome Center were constructed. The final part of the resort's master plan, the buildings included condominiums on the upper floors. The three season business was further improved in 2006 when the second mountain coaster in the United States was installed at Jiminy Peak. Its success led to similar installations across New England in subsequent years. 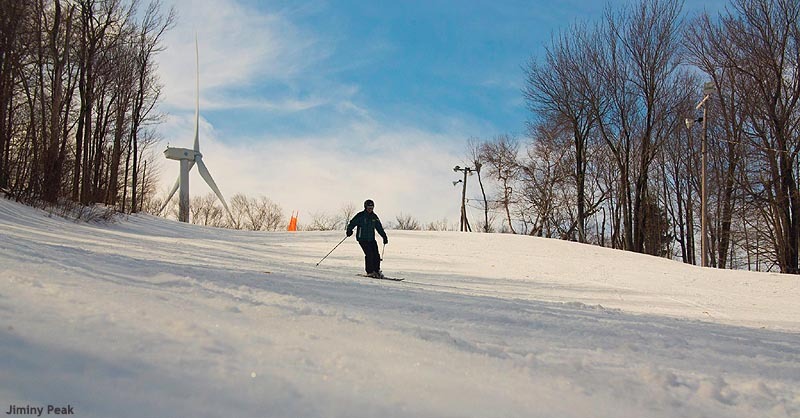 In 2007, a 4.6 megawatt wind turbine was installed near the ski area. A solar farm would follow eight years later. On January 27, 2009, co-owners Brian Fairbank and Joseph O'Donnell sold Jiminy Peak to CNL Lifestyle Properties. for $27 million, while obtaining a 40 year operational lease of the ski area. In subsequent years, Brian Fairbank and his son Tyler took over operational control of Bromley and Cranmore, using Jiminy Peak as the model for base area development at the New Hampshire resort. "Anyone remember Mr. 360? He was in a shack at the top of one of the trails and would ride down the mountain at the end of the day standing on a shovel." "On a trip from Delaware to New England a couple of years ago I stopped off on my way home and had a great day. I do not need a big mountain to have a great day. This resort is a great family resort. I will do this Mountain againJon OsbornOSBORN2SKI"
"I would like to have the original history of the land sold. My Grandfather John Adams was the one who sold the land to the future owner of Jiminy Peak. If you look up original records you will find this true. My uncle continues to own land close to Jiminy Peak. We continue to be loggers in that area."